Helen’s lunch, what can I make for her since she is on a gluten free, dairy free and Safe Zone Diet. So I searched my fridge to look for ingredients to put together a meal for her. I decicided to make what I called Retro Smoked Salmon Salad with Caviar (very 80s presentation). I believe that she would gladly trade that for my 3 days old sambal, hard boil eggs and rice meal. But since she is allergy to eggs and off chilli…sorry lah! Wash and chop up the salad roughly, wash radish, trim off the head and the end and cut into wedges. Cut avocado into 1/2 and scoop out the flesh. Mix salad, radish and avocado then place that on a plate. Blanch cauliflower for 1 minute to inactivate the goitrogen and also place that on the plate. top the salad with 2 slices of salmon. Peel cucumber, cut into 3 equal section and use a small teaspoon to scoop out the centre part of the cucumber to make into cucumber cups. Chop the two remaining smoked salmon and fill up all the 3 cups. Top with with chopped onion and then with cavair. 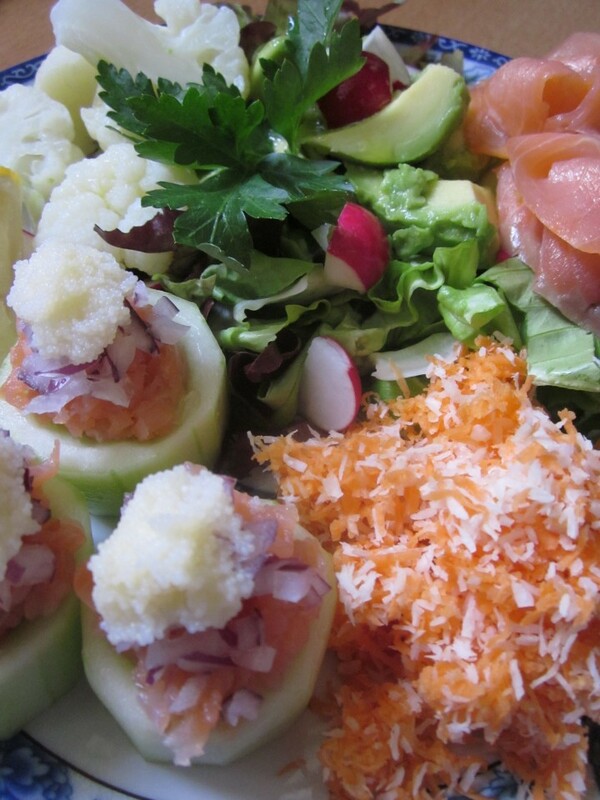 Place on plate and serve Retro Smoked Salmon Salad with some olive oil and a wedge of lemon.